Mea Vita: Carpe Diem: Happy Birthday Apple? When I saw this piece Happy Birthday to Apple earlier today I was reminded of a large meeting I was in with Steve Jobs back in aught-two when someone in the room congratulated him for founding Apple 25 years earlier, in 1977. Steve's response to the well-wisher was that Apple was really founded the previous year, in 1976. Steve commented how hard he and Woz had worked in 1976. To Steve, that first year was, naturally, a much bigger deal. One thing that I noticed during my time at Apple was that Steve's responses were rarely what you'd expect. Sometimes, he'd point out the obvious and other times his answers were opaque. But, regardless of his answer it was usually a positive learning experience. Once, after going over the iPhone sales figures with both my boss and his boss we concluded that there just weren't enough customers with Cingular/AT&T to reach the iPhone market share numbers that Steve had recently announced, in January 2007. I briefly laid out Cingular's/AT&T's customer base to Steve and then I asked him how Apple planned to achieve the forecasted iPhone market share. Steve's direct, yet pleasant response, which we had overlooked was that Apple would also be selling the iPhone in Japan to make up the difference. We were humbled amateurs in the presence of greatness. In that same meeting a coworker asked Steve which companies he admired most. Steve took a surprisingly long time to think about his answer. It seemed like a solid sixty seconds of silence. While he contemplated his response I speculated on his answer. Would he say Google, Amazon, Nike, etc? As he slowly shook his head he responded, "I don't know. I'd have to think about that." This lead to even more speculation as to why he didn't have a concrete answer. I've seen raw footage of Steve's interviews where he would pause for a long time knowing full well that the dead air would be edited out. He was also not shy during a taped interview to stop and ask for a retake. After all, why not do everything possible to look your best? 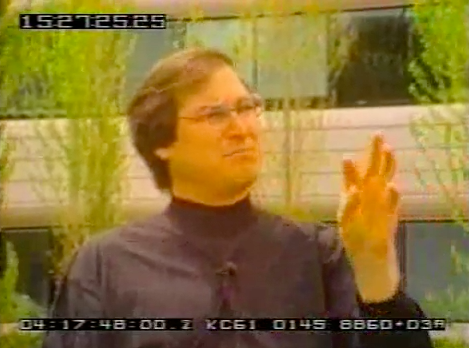 Later, in that same meeting about companies he admired, Steve spoke about company culture and how proud he was that Apple was a "California company." Hmm, I thought, what makes a company a California company? I figured that it was the same thing that makes a financial company a "Wall Street company" or an advertising company a "Madison Avenue company." The right company in the right place makes a world of difference. Location, location, location, along with superb execution. Why Have I Forsaken RSS?